Children from almost all backgrounds are being sent earlier and earlier to play schools, many of which do not deserve that nomenclature. Most of them “preoccupy” their wards leaving them with hardly any space to day dream.The creative and formative years of a child’s life is taken up with planned ‘activities.’ Where is the place for imagination? Against this reality, this book comes as a refreshing breath of air. 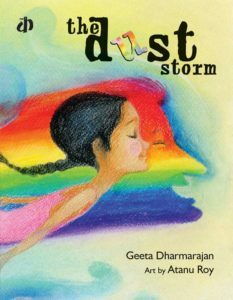 The story opens with a young girl who steps out of her ordinary home and is carried along by a dust storm. The remaining pages are pure joy as the young girl encounters magical situations that every child could and should envision. Atanu Roy wafts both adults and children into meadows of flowers, clouds of balloons and a myriad rainbow. There is a sense of free flow in his use of colours and movement. An artist who lives his dream! Geeta Dharmarajan is a master story teller but of late I had missed the spark in her writing. She is back in full force in this tale with rhyming couplets and soaring images. And again, “I slide on balloons. I was reminded of the poem “Who has seen the wind?”by Christina Rossetti. The production, as always is excellent. Usha Mukunda. usha.mukunda@gmail.com October 29th 2014.